or less in Annapolis, MD. 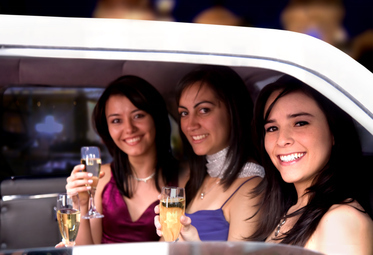 Whether is it is a graduation, a dance or a party, why not do it in style in a lovely lavish limousine or a party bus if you have a large party? You can start celebrating as soon as you leave your home and not have to worry about driving and directions and parking. Plus, you don't have worry about drinking and driving and can continue to celebrate or party all the way back to your home. (Of course, for high school graduation parties, drinking can't be allowed.) Better yet, you can all go together and not have to worry about multiple cars and parking and where to meet up. 1. Our drivers are excellent. They are well trained, professional and professionally dressed. They strive to make sure you have an enjoyable and memorable time. You won't need to worry about schedules or destinations! Your chauffeur will be to your place on time or early. 2. What is special about our lovely lavish limos and party buses? Luxurious leather seats, flat screen TV, CD/DVD player, and a bar area with stemware. 3. We are here to serve you! We work around whatever schedule you need. You can also specify multiple pick up and drop off locations. We drop you right at the event. You don't have to struggle to find parking in Annapolis and then walk forever in good clothes, especially heels for the women. 4. Make graduation easy. With all the traffic and the limited parking, Annapolis can be a nightmare. With a limo, parking is solved and you won't have to worry about the traffic, your chauffeur will. 5. Make a party of going to the dance or party! You won't have to coordinate about where to meet, deal with multiple cars, etc. The party starts as soon as you step into the bus. You just relax and have a great time and let your limo driver get you where you need to be. It just takes 3 minutes or less to get your graduation limo. Fill out the form above right for a quick FREE quote. Or give us a call at 410-793-1321.